South Korea will sharply increase its investment in science and technology setting a 92.4 trillion won ($80 billion) budget to finance research and development projects in new growth sectors by 2017, the government announced on Monday. The plan represents a more-than 30 percent increase from the previous Lee Myung-bak administration’s five-year budget of 68 trillion won. As part of the five-year science and technology development project, the budget will be allocated to enhancing agricultural and medical technology as well as supporting basic science research. The government said it believed the investment would help elevate the level of science and technology research and help create some 640,000 new jobs. The announcement made following the first meeting of the National Science and Technology Council on Monday. The R&D control tower was created in 2011 under the Lee Myung-bak government to strengthen the country’s capabilities in basic science. The NSTC is responsible for the distribution of state resources and carrying out evaluations on all state-funded R&D projects. In a bid to promote a science and technology-based creative economy, President Park Geun-hye reformed the NSTC this year as the highest decision council in the field of science technology with all 13 ministers in each government department and civilian experts in various fields taking part. 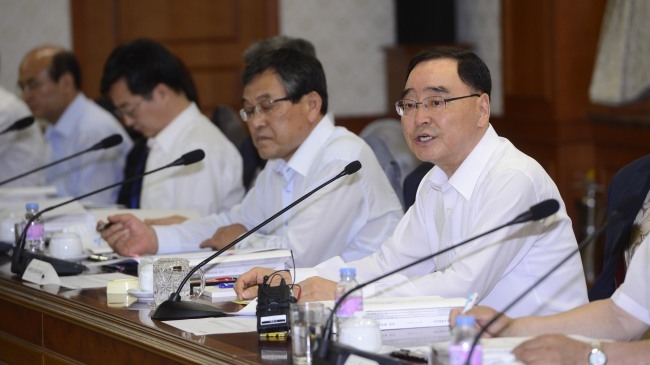 The head NSTC position that used be a ministerial level is now chaired by Prime Minister Chung Hong-won. The government has also appointed 10 experts as a civilian advisory panel, including LS Group chairman Koo Cha-yol; Kim Young-joon, president of Gwangju Institute of Science and Technology and Kim Jin-hyung, professor of computer science at the Korea Institute of Science and Technology. “We believe science technology will be the driving force for national growth and economic development, and the role of the NSTC will be crucial. We feel great responsibility,” the Prime Minister Chung said during the meeting.